Wanjidari means white flower. I was born in 1965. 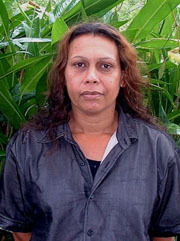 My mother came from central Queensland at a place called Woorabinda and came from the tribe Wadja Wadja. My father came from Lockhart River from the Kuntha Napu tribe. I have been painting since I was 17 and the inspiration for my paintings came from both sides and from my childhood. When I was growing up I would often go out with my aunts and other family members to collect bush tucker the traditional way. We would look for turtle eggs, goanna, fruit, yams, etc. so I grew up with my culture. I now have 8 children of my own and my eldest son also shows tallent in painting. Many years ago I did a TAFE course so that I could learn to use different mediums and to help develop my style. Exhibitions since 1986 include: The Upstairs Gallery, Cairns; Ben Grady Gallery, Canberra; Wavana Art Exhibition, Brisbane; Queensland Aboriginal Creations, Brisbane; GWW Gallery, Palm Springs USA; Hamburg Art Fair, Germany; The Gould Gallery, Melbourne; Contemporary Australian Visions, Melbourne; Burwill Gallery, Brisbane; Emerald Hill Gallery, Melbourne; Trilogy, Brisbane. Public and Private Collections: BHP - Brisbane; BHP Petroleum - Melboune; Former Prime Minister Robert Hawke; Queensland Art Gallery; Queensland Museum. There are many paintings in private and corporate collections throughout Australia, England, Ireland, Germany, South Africa, Japan, USA and Canada.